There is a most unusual place at 2 Doncaster Gate in Rotherham, UK called Grimm & Co. that has been selling wild schemes, evil plots and kitchenware to magical beings since 1148. When one goes to enter a store in America, there is sometimes a sign that says something like, “Shoes and Shirts Required.” Not so here. When I walked up to the front of this marvelous old building, I was greeted by a most unusual warning. There were eleven things that were not allowed in this shop. No flying, spells, fair maidens, black magic, eating (including staff), haggling, knights (shining or otherwise), groups of ogres (max 2 at a time), cursing, smoking (phoenixes – use bucket provided), and humans. Now, the first ten restrictions were no problem, but that 11th one – now that could be bad news. Since no humans were apparently allowed in, I wasn’t sure if the portal into this place (the front door) would allow me to pass. However, I suppose that anyone who writes fantasy tales (like me) must have something peculiar in their blood, since strange stories of magical beings keep slipping out of them and onto the pages of books. So, I pushed on the door. It opened for me, and I entered. The very first thing that she asked as I entered was whether or not I was magical or not. I muttered something incomprehensible, so she ushered me over to a very special scale that apparently detects what sort of magical being you might be. I am quite pleased to report that I am not an ogre, troll, goblin, bogard, harpy, or hydra. I very nearly tipped the scale into “pheonix”, but landed on “warlock” instead. Well, that was surprising. I suppose it could have been worse – I could have gotten “gargoyle”, “wicked”, “bewitched”, or even “nymph”! But, my new elf friend seemed satisfied, and proceeded to take me on a tour of the shop. Now this was my first experience in an ‘Apothecary to the Magical’, so there was a lot that needed explaining. The walls and displays were filled with marvelous and strange things that I had never seen before, and which must have contained powerful magic, for I was immediately tempted to whip out my wallet and buy many of them. One display was especially interesting, for there were items that were obviously used in cauldrons, potions, and elixirs – things like “Goblin Mucus”, “Grandma’s Scabs”, “Condensed Enthusiasm”, and others. Well, the tour continued, with various oddments such as “Giant Belly Button Cleaner” (which looked quite similar to a feather duster), booklets with titles like, “How to Keep Humans and Other Livestock”, “Songs, Poems, Curses”, “How to Avoid Humans”, and others. “Human Disguises”, as well as items, such as “Leprechaun Wishes”, “Fairy Dust”, and of course “Rocking Horse Excreta”. Prices were quite reasonable, especially considering the rarity of some of these items. Now one of the truly unique features of the store (and don’t tell anyone) is the “Black Market Meat Cellar.” Here you can get pretty good deals on “Fairy Cakes” (96% fairy contents – not much filler! ), “The 8th Dwarf” (a bit expensive – personally, I’d watch for sales), “Flank of Unicorn”, and “Freshly Peeled Knight”. If you’re like me and prefer Farmer’s Markets to these magical Black Markets, you can just make excuses like, “Well, the Knight looks to be a bit overcooked”, and “You know, that Unicorn looks good, but I’m trying to avoid being eternally cursed – bad for the digestion.” The elves in the store may shake their heads, but they’ll gladly sell you other things instead. Oh, did I mention that there’s a magical item museum too? Yes indeed, and it’s complete with such wonders as the glass slipper, grandma’s glasses, Rapunzel’s hairbrush, and other extraordinary relics. Don’t worry about the cursed wand – it’s safely behind glass. All of that is stupendously fun, but this apothecary also holds an even deeper secret. Hidden away, in a place where only true believers (like children) can go, is a mystical chamber where the real magic happens. Through a secret doorway, you just might be able to pass into a realm filled with what I call thin places. Linger long enough, and you may be swept away on a grand adventure through the pages of a book written by a little girl or boy. Any good story can become a thin place through which you can pass if you simply suspend disbelief. You see, in this special place, children can come and hear strange tales told by the elves, read books that draw them into far away lands, and most importantly, write their own stories, and have them published on the magical presses of Grimm & Co. The magical beings of Yorkshire, old Mr. Graham Grimm among them, have developed this marvelous charity that champions the writer in every young person (ages 7-18) through the joyful discovery of story. It is a place that is truly unleashing imaginations, and well worth supporting. I hope that one day I’ll get back to 2 Doncaster Gate in Rotherham, UK, and take my family with me. I’d love to see what magical beings they weigh in as! ps. – This shop is mentioned in book #4 of The McGunnegal Chronicles, and will be visited by the characters in future books… keep an eye out! This entry was posted in Uncategorized on November 20, 2018 by Ben Anderson. March 26, 2018 was a beautiful spring morning to go looking for a holy well in Cornwall where a fairy was rumored to live. I was in the UK on business, travelling around looking for sites that I have either included or may include in The McGunnegal Chronicles fantasy book series that I’m writing. I had spent the night at the Little Mainstone Guesthouse in Looe, an amazing B&B in an equally amazing town along the coast. The tide was out when I arrived, leaving the boats high and dry. With the help of the Little Mainstone’s owners and a few Google inquiries, I set out to drive up to Hobb’s Park, where Saint Nun’s Well was said to reside. It’s said that one should never go to a holy well without a gift (some say for the elf, fairy or piskie that guards the well, and some say as a way of honoring the saint to whom the well is dedicated). I wondered what gifts I would find inside the well when I arrived, and what I might leave behind. More on that later. Saint Nun (also Non, Nonna, Ninnie, or variations of that) was Saint David of Wales’ mother (St. David, who died in c. 589, is the patron saint of Wales). The location of Saint Nun’s well is in Pelynt, which is thought to be from the Cornish Plu-Nent, meaning “Parish of St. Nonna”. It would only be appropriate that a holy well dedicated to her would be here. She is, in fact, the patron saint of Pelynt. You can read more about her on Wikipedia and other places. The drive up to Hobb’s Park was beautiful and mysterious, up a one-lane road that was often like a tunnel, with overhanging trees covered in moss and vines. It felt old. When I arrived at the entrance to the park, there was a place to pull off, so I did, and I decided to walk to the well. A sign pointed the way. One is immediately aware of the richness of this place. Sheep graze on beautiful green hills that run steeply down to a river, songbirds sing, pheasants squawk, and wildlife abounds. On this morning, a cool mist rose from the deep valley, rolling up the hills and melting away in the sun. It only took a minute or two before I spotted a sign on the right side of the path that told me that I’d found what I was looking for, and a path of stone steps led past an old oak tree that grew just above the well. I must say that I was rather excited to see this place. It is, after all, where the fourth book of The McGunnegal Chronicles basically ends. It’s thought that this well dates from medieval times and was rebuilt in the 19th century. The stone basin inside is thought to date from Norman times. So, I was approaching a site that has been in use for well over a thousand years. A book from 1894 entitled, Ancient and Holy Wells of Cornwall (now in the public domain), by M. and L. Quiller-Couch, relates some history of the well, gives an interesting legend regarding it, and shows a picture as it supposedly looked in that time (see the attached picture). Quiller-Couch says that he supervised the rebuilding of the well at that time because it was in a poor state of repair. The tree that grew above the well had to be cut down, he says, because its roots were destroying the stonework. What is quite curious to me, however, is that there is a tree above the well today (some 124 years later), and it looks almost exactly like the tree depicted in the 1894 picture. If Quiller-Couch was correct, and the tree was removed, someone wanted that tree to grow back just as it had been before. Either that or there was a second tree that was removed. As I walked down the well-trodden path and around the corner, I was greeted by the bleating of sheep and a deep valley. It was stunningly beautiful, and the brilliant blue sky accentuated the surrounding green and brown hills. Looking left and right, the beauty rolls on as far as one can see. It is truly a piece of divine artwork – the kind of place a tired body could come and sit and let all the stress of the day simply roll away. As I rounded the corner, St. Nun’s Well greeted me. There it was, just as green, beautiful, and old as all the pictures I’d seen, and as mysterious as cazzyjane’s painting makes it (her painting is on the cover of book 4). The entrance is, perhaps, four feet high and two feet wide, and the plant life all around and on the well’s face is vibrant and growing, even in the cool weather. To me, it felt as though the well is giving life a boost here. Something about this place seems to just gather nature around itself, drawing it close, and giving it a potency. I’m a member of several Facebook groups that focus on holy wells, and one word that is used time and time again to describe the sense one gets in these places is atmosphere. Indeed, this place has a wonderful atmosphere about it. Words really fall short, but the best I can say is that there is a sense of wonder, peace, wildness, and health surrounding the well. You’ll just have to go there yourself and sit for a while and listen, look, and experience it. Some things in life must be tasted rather than simply thought or read about. Holy places are like that. So, I decided to go in. One might expect the dark interior of a well like this to be rather dingy, devoid of life, or muddy. But what I discovered was just the opposite. There is an absolute abundance, or shall I say, an explosion of life in this place. As I write this, we are just a week out from the close of winter, and the interior of St. Nun’s well is overflowing with green plant life. Pure water runs into a round basin. I couldn’t resist – I dipped my finger in the cool water and made the sign of the Cross on my forehead. Orthodox Christians like to do that with holy water. It’s not a superstition or magic – it’s a blessing. God uses things in the material world as instrumen ts of His grace. Now, when I said there was an explosion of life here, I wasn’t just talking about the plants (which do cover much of the interior). Hidden away in the cracks and crevices of this ancient place are an abundance of creatures who call it their home. As I mentioned earlier, they seem to be drawn here. As I explored, I found several little insects – perhaps tiny moths, or mosquitos (although they didn’t bite, or even buzz around me at all). That’s a curious thing, since it’s said that visitors who fail to leave a gift (such as a bent pin) will be followed home by clouds of piskies disguised as moths. There was also a little spider whose web hung delicately among the greenery, and a larger, black spider about the size of a quarter that sat quietly among the rocks in the ceiling. I hope my presence didn’t disturb them too much, but they didn’t jump or run away, but seemed to tolerate me. Then I found the snails. Not just one or two, but what seemed to be a whole family of them. They too were quietly resting in the cracks and crevices of the well, content to just be there. I’m not sure what species these were, but Wikipedia lists quite a few non-marine molluscs that have been found in Great Britain, 150 of which live on land. I counted close to a dozen of these snails just in one area, and there appeared to be more of them that were half buried in the soil that has accumulated in some of the crevices. Perhaps these snails had dug in for the winter, or perhaps I had discovered a snail grave yard. I have no idea. After finding the snails, I found yet another creature that called St. Nun’s Well its home. It was hanging quietly from the roof, and was quite unconcerned about my presence. In fact, I would have completely missed it had I not looked directly up at the peak of the ceiling. Its wings were wrapped completely around its two-inch body. Based on a quick Google search, it appears that some bat species do this when hibernating. Perhaps this little fellow hadn’t woken up from his long winter’s nap just yet. There is a “Bats in Cornwall” Facebook page. Perhaps they could identify him (or her). So, St. Nun’s well is burgeoning with life – a variety of plans, insects, arachnids, snails, and even a bat. They’ve all gathered together here, drawn to the well’s atmosphere, and are thriving. Perhaps some, like the snails, spend their whole life here. However, that’s not the only thing that makes this well special and a bit mysterious. People are drawn here too. Many people. One only need look at the many gifts and offerings that have been left to see how sought-after this well truly is. Some leave these for the elf or piskie that is said to guard this place. Some leave them in honor of Saint Nun. There are pins, coins, little pots, a cross, a necklace, a votive candle, bits of this or that, and even a bit of cake (which, by the way, looked suspiciously nibbled on). How strange and curiously wonderful this is! It’s just something that ought to be smiled at with a sense of wonder and thanks. I think that we are often too rationalistic, too quick to look for logical and “natural” explanations for things, and because of this we lose our childlike sense of wonder and just plain fun. Maybe God was having a little fun here too. If there is a piskie living in and guarding St. Nun’s well, he certainly has lots of company with which to while away the slow Cornwall days. And that brings me to the last point. What was I to leave in this magical place before I left? I found a bunch of pale yellow primroses growing outside, so I picked one and placed it by the pool in the well. Then I said a prayer, asking God to bless the waters, the stones, and all the life within it. That was my parting gift. No moths, spiders, bats or snails followed me as I climbed the steps one last time and walked back up the path. I hope to return some day to St. Nun’s Well and visit all the little creatures within it. But I especially want to see the little fairy statue again, and see how long her hair has grown. Through the prayers of St. Nun, O Lord Jesus Christ our God, have mercy on us and save us. Amen. This entry was posted in The McGunnegal Chronicles, Uncategorized and tagged Christian, Cornwall, Fairy Tales, Holy Wells, Legends, Orthodox Christianity, St. Nun, The McGunnegal Chronicles on March 31, 2018 by Ben Anderson. Into a Strange Land is the first book of The McGunnegal Chronicles series. It’s 1846. Ireland is starving under the Great Hunger. Colleen McGunnegal and her cousin, Frederick, discover that her great grandfather has been hiding a secret in the potato cellar – a relic from a lost age of Ireland. They fall into this relic and find themselves in the Land of the Others – the place where all the legends began, and where the creatures of those legends live on. Grand adventures spill through the pages, carrying the reader from the imagination to the heart. There are three books in the series so far, and from January 26-27, 2015, the first book will be available on Kindle for free! Hope you all enjoy these tales! I’m working on Book #4! This entry was posted in Uncategorized on January 25, 2015 by Ben Anderson. There are fairy tales, legends and stories about Goblins that run all through European history, going back a thousand years, and even appearing in our own lifetimes. Even such notable tales such as Pilgrim’s Progress mention these creatures. One wonders where all these tales came from. Was there a common source long ago? If any readers have theories, I’d love to hear them. The Goblin Cave next to Loch Katrine in Stirling, Scotland. The Goblin Combe in North Somerset, England. The Pyrenees Mountains in Southern France. The Fairy Graveyard in Brinkburn Priory. The tale of the Pyrenees Mountains is particular interesting. It is said that in pagan times, monstrous creatures lived in the forests and mountains of southern France, particularly in Vallespir, a region of Northern Catalonia. One legend that comes to us from the tenth century, before the Great Schism of Eastern and Western Christianity, speaks of these “Simiots,” or “goblin monkeys” terrorizing the small town of Arles-sur-Tech. 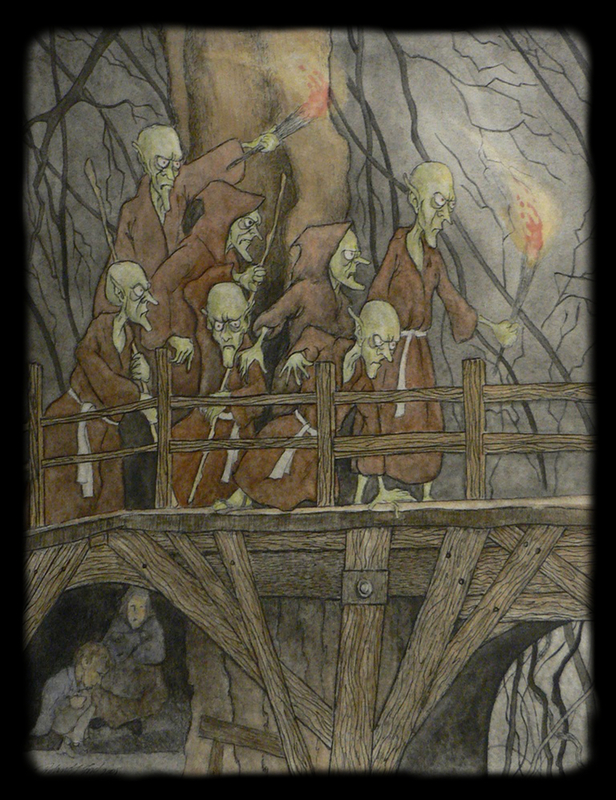 The abbot of Arles, Arnulfe, felt that the reason for this invasion of goblins was the sinfulness of the villagers, and felt that if they only possessed the relics of a Saint, that this would balance out their sins and put an end to the problem. Journeying to Rome, he acquired the relics of Saints Abdon and Sennen, Persian saints who had been eaten by lions in the Roman Arena. Once the relics arrived in the town, the invasion of the Simiots ceased. The bones of the saints were stored in “La Sainte Tombe”, and this tomb has run with pure water ever since. Once a year, monks continue to siphon out the water with a silver pump for pilgrims. Above is a picture of La Sainte Tombe. It is curious that this region of southern France and northern Spain is home to a number of legendary creatures other than goblins. For example, Montmajour Abbey, located in the region of Province in southern France, has a carving of a tarasque devouring a man. It is dated from the twelfth century. The tarasque was said to be a dragon-like creature that defeated both knights and catapults when the king of Nerluc attacked it. However, Saint Martha went to the beast and charmed it with hymns and prayers. She led it tamely back to the city, where the people, fearful of it, attacked it as it drew near. It offered no resistance and died. Martha then preached to the people and converted them to Christianity. The people, sorrowful that they had slain the tamed creature, changed the name of their town to Tarascon. Below is a picture of the carving of the tarasque. What gave rise to such legends? Perhaps we can only speculate. But something happened a thousand years ago that was terribly traumatic to the local population, and we now have churches and holy sites that keep such memories alive. But let’s get back to goblins. Along with the tales of evil goblins (such as the Irish Pooka) are tales of “good” goblins as well. For example, the Gesta Romanorum, a Latin collection of stories from the late 13th or early 14th centuries that comes to us from England bears a tale called The Benevolent Goblin. These, however, seem to be rare. In The McGunnegal Chronicles, the goblin peoples were not always evil. Something dreadful happened to their world, and the Great Worm turned what had once been a beautiful people into dark and hateful creatures. They bathe in and drink “the ooze,” a stinking black slimy liquid, and their bodies are often covered with the worms that inhabit the ooze. They believe that this ooze gives them eternal life, but it, in fact, slowly drains away their life. However, there is one good goblin that Colleen McGunnegal encounters in her adventures, and her names is Evchi. She is a hermit, living in the desert, and by the time Colleen meets her, she has been out there for forty-seven years. She is nearly free of the ooze and its worms, and has returned to the former beauty of the ancient goblin peoples. Nous, another goblin that Colleen saved, and who is travelling with her, is fascinated by this good goblin. He spends long hours talking to her, and in the end wants to be like her, although he is disfigured and covered in the ooze worms. His personal journey through the books is not your typical “coming of age” story – it is a journey transformation from his old view of life to something radically different. Nous is an important character in The McGunnegal Chronicles books, and something remarkable happens to him in the end. I won’t spoil the story by telling. There will be more goblins throughout The McGunnegal Chronicles books, and readers can expect an intertwining of the old tales that have come down to us with new adventures and challenges for Colleen and Frederick. This entry was posted in Uncategorized on August 17, 2014 by Ben Anderson. Dwarves are a curious folk in mythology, and have even more curious roles that they play. They are said to have made some of the most significant magical items (such as Odin’s spear and Thor’s hammer), and so played significant roles in the outcomes of battles and intrigues among the Germanic gods and other beings. The influence of dwarvish tales on our modern society has largely been forgotten, even though some of their very names still linger on. In the Norse creation myth, for example, after the earth, sea, hills, plants, heavens, Midgard (middle earth), and the clouds were created, the gods stationed four strong dwarfs (or dwarves, as popularized by Tolkien) named Nordri, Sudri, Austri, and Westri at the four corners of the heavenly vault to support it on their shoulders. From these we have received the four points on the compass, North, South, East and West, as we now call them. The dwarves of the general variety in Norse mythology were originally maggot-like beings, who were summoned into the presence of the gods and endowed with intelligence. These new creatures were then divided into two classes – those who were dark, treacherous, and cunning (dwarves, trolls, gnomes and kobolds) and those that were fair, good and useful (fairies and elves). The former were consigned to live underground in Svart-alfa-heim (the home of the black dwarves), and would be turned to stone if exposed to sunlight. The latter dwelt in the realm of Alf-heim, between heaven and earth. Thus, at least in the earliest tales, the dwarves were considered to be in the same class as the other creatures of the night, and this may help explain another piece of old trivia. Allow me to go off on a little tangent here about the curiosities of the medical practices of some thousand years ago. There seems to have been, in the Anglo-Saxon tradition, the use of “metrical charms” to heal maladies and diseases, or to deliver from bad situations. These seem to have been a combination of prayers, sayings, verses, invocations and herbal remedies. Mingled within some of these remedies seem to be old cultural memories – old idioms and words that harken back to a pre-Christian era when belief in the old gods and the creatures of legend was the stuff of everyday life. That brings us back to the dwarves being creatures of the dark. One of these charms, called “Against a Dwarf,” seems to be a remedy for sleeping disorders, and may associate dwarves with a sort of night demon, perhaps similar to the “mare” in “nightmare”. The reason some think this to be so is because this particular charm mentions both a horse and the “Seven Sleepers of Ephesus,” which is a story that is found in early Christian tradition. There are Orthodox Christian icons that depict these “holy youths” (commemorated on Oct. 22) and their tale can be readily found and read on Orthodox websites (notably without any mention of dwarves, by the way). Anyway, this particular remedy calls for the names of the Seven Sleepers to be inscribed on seven “wafers such as one might offer” (I wonder if this harkens back to a tradition of offering wafers/loaves for Communion purposes, or perhaps to the seven loaves mentioned in Matthew 15:36? ), and these were hung around the neck of the afflicted person by a virgin for three days. The Christian themes in this remedy are obvious and apparent, but there is also a rhyme that is chanted three times that seems obscure, and may harken back to those earlier pre-Christian days when things like nightmares were thought to be caused by supernatural causes – like dwarves. It would be a curious thing to be able to trace these riddles and rhymes back through the centuries to see where they all began, and where the dwarf came into the picture. The etymology of the word “dwarf” seems to be shrouded in mystery, and there are various theories about its origins. There are, of course, other traditions about dwarves. Disney popularized the tale of the Seven Dwarfs back in 1937, giving them cute names that children would enjoy, but the tale did not start with Disney, and was recorded by the Brothers Grimm in 1812, which itself was an adaptation of an earlier play called “Little Snowdrop” (1731). Tolkien greatly popularized dwarves in his wonderful tales of The Hobbit, the Lord of the Rings series, and The Silmarillion, and while these dwarves lived largely underground, they did not shun the sun as did goblins and orcs, nor did they turn to stone as did the trolls in Tolkien’s tales. In the legends of Europe, there were mountain dwarves (the most magical), mine-dwelling dwarves (the most spiteful), and even dwarves that assisted men with agricultural pursuits (such as the Swiss dwarves). There was also a curious newspaper article in the Morpeth Gazette in 1889 about a race of rather ugly dwarfs known as the Simonside Dwarfs who occupied the Simonside Hills of Northumberland in northern England. These mischievous dwarves delighted in leading people astray, particularly at night, sometimes carrying torches to lead the unwary into bogs. So, the dwarven folk of legend are varied and complicated, some being good and some bad, some magical and some menial, and they appear in most Germanic/Nordic/Anglo-Saxon mythologies to one extent or another. One last note. In The McGunnegal Chronicles, I’ve tried to adapt various world legends about dwarves, hinting at a number of old tales. Don’t be surprised if the Simonside Dwarfs show up in the fourth book, getting stirred up after many years of hiding. It is 1846, after all, and in just 43 years the newspaper will be reporting on them. In this fourth volume, Colleen and Frederick also go to the land of the Dwarves in pursuit of Colleen’s grandfather, and find that it has fallen into a fractured state of disbelief, where the old ways have largely been forgotten, and the old dwarven magics neglected in favor of inventions. There, in the deepest realm – at the very heart of their world – the great gift that was given to the Dwarven people has been taken by … well, I won’t give it away. But I promise lots of adventure, new monsters, forays into the worlds of fairy tales, and new discoveries for Colleen, Frederick and all of The McGunnegals. The tentative title for this books is World of Unreason. Guerber, H. A., Myths of the Norsemen From the Eddas and Sagas. This entry was posted in Uncategorized on July 15, 2014 by Ben Anderson. Who is this man who lies in such tortured serenity? A saint? A thief? An unlucky soul? His face, a mix of peace and pain. Kept safe in the long memory of the bog? His hat and belt, strange, perplexing questions. Stills the mind, and makes one stare in silent wonder. 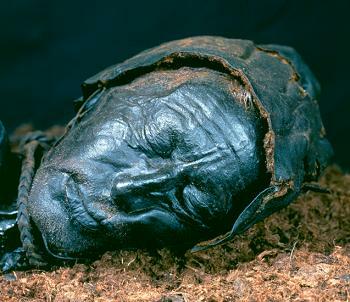 I think that the Tollund Man may make his way into The McGunnegal Chronicles one day. For several long moments, they stood in awe, gawking at the gigantic room they had entered, whose golden walls arched upward to form a great red-gold domed ceiling that was crammed with crystals of every color, some as thin as hair, and others huge and jutting from the ceiling like great spikes. All were shining, radiating brilliant light that filled the cavern with a multitude of rainbows. The floor was gold as well, and every inch of the room was so perfectly polished that it reflected everything around them as if they were surrounded by mirrors, or perhaps were inside a mirror. The effect was to make everything seem to stretch outward forever and ever, the light and gold and rainbows going on and on until it went beyond their vision. “Behold the Crystal Cavern – the Hall of Sindri!” he cried. In this scene, Colleen, Frederick, the Wigglepox family (Leprechauns), Doc (Sindri) the dwarf, and Dvalenn (the sleeping dwarf) go into a huge, marvelous hall of red gold whose ceiling is covered in magic gems that shine with and unending cascade of rainbows. This is the Hall of Sindri, made by the dwarf, Sindri, over a period of thousands of years. In Norse mythology, the Hall of Sindri is a golden hall in which the good and righteous will dwell after Ragnarök. But when Colleen and Frederick encounter it in The McGunnegal Chronicles, it is not yet a dwelling place of the righteous, but a place where one can truly see the truth of one’s self. Its golden walls are like mirrors for the soul, refracting it like a prism, and showing all of its subtleties, devices and passions. Frederick paused, looking at the image of himself before him. He stared for a moment, and suddenly it was no longer just a reflection of his body, but a darker image. Its greedy eyes darted back and forth to the gems around it. It smiled malevolently, reaching out to grab one of the glowing stones. Frederick shut his eyes. “I don’t like looking at myself like that. I’d rather not even see that stuff,” said Frederick. In Orthodox spirituality, being honest with oneself about oneself is of first importance. Still, at times we cannot see our own faults, and we need help to see the subtleness of our own heart. Jeremiah lamented, “The heart is deceitful above all things, and desperately wicked: who can know it?” (Jer. 17:9), and the Psalmist prayed, “Search me oh God, and know my heart: try me, and know my thoughts: And see if there by any wicked way in me, and lead me in the way everlasting.” (Ps. 139:23-24). As the golden walls of the Hall of Sindri let Frederick see his hidden self, so we often need help to untangle the ball of yarn that is our inner self. We need a spiritual father or mother. We need the angels. We need the saints. We need the mother of God. We need each other’s prayers and compassion. We need the Mysteries of the Church and her ascetical practices. We need the Scriptures. We need the Cross. And oh, how we need God. With such mighty help we can stand before the mirror and honestly take stock of who we are. As the layers of the onion are peeled away, and the doors of repentance swing open, God will give us the grace we need to walk through. Somewhere deep inside is the true self, the person created in the image and likeness of God, that person who longs for all that is good and holy, and for union with God himself. All else is nothing but a tangled web of passions that serves only to blind us and distract us from who we really are in Christ, the One who became like us so that we could become like Him. This entry was posted in Uncategorized on April 26, 2014 by Ben Anderson.